Originally the game was to be capped at 5 players, but Jamey Stegmaier wanted to include 2 new player mats in the expansion. He realized that some people were going to use the mats to play 6-7 player games no matter the what the box says, so he wanted to make sure the game worked for them! To scale up, the expansion includes alternate abilities for some of the original factions. New Angeles, a board game of corporate greed and machinations for four to six players set in the Android universe! In New Angeles, you gain control of one of these megacorporations. Then you use your wealth and influence to create more wealth and more influence. To do this, you’ll cut deals and forge temporary alliances. You’ll leverage your credits and assets to gain financial superiority over your corporate rivals. All the while, you’ll also need to keep an eye toward the masses, striking deals with the other corps as necessary in order to keep a lid on crime, disease, and unrest. If you want to maximize your profit, you need to keep New Angeles open for business! Business is your primary concern in New Angeles. After all, the city is uniquely favorable to businesses not only because it’s the site of the Space Elevator (or “Beanstalk”), but also because the city enjoys the privileges associated with being an unincorporated, special commerce zone of the United States. It benefits from most U.S. federal laws, but fewer Constitutional demands, meaning that its inhabitants—and its corporations—enjoy more freedoms than those within the United States proper. And the megacorps, who benefit from this tax-free arrangement more than anyone else, intend to maintain this status quo. The key to meeting both of your goals, then, is to conduct good business. Negotiate with others when it works for you. Manipulate others when you must. Keep your ambitions secret. Publicize your positive contributions and mutually beneficial business arrangements. Get others on-board with your designs… and then make more credits than them all. As the head of a powerful megacorporation, you’ll find there are plenty of different ways for you to lead your company in pursuit of ever greater profit. However, most of these revolve around your ability to steer the city’s development to your interests. Games of New Angeles are played over a number of rounds, and in each of those rounds, you and your friends take turns proposing different types of business deals. These different deals are represented by action cards, each of which comes with its own game effect. 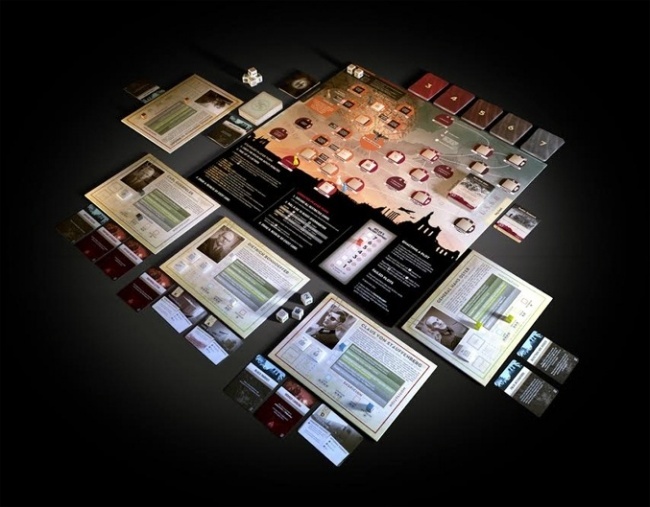 At the beginning of your turn, you’ll draw a number of action cards as indicated by your corp sheet, and then you’ll present a deal to the other corps, choosing one of your action cards to place onto the board as your offer. Meanwhile, each round will see a new asset placed upon the game board. Each of these assets represents a talented and useful person or organization, and if you can get the other corps to deal with you and support your offer, you claim the asset and stand to reap its benefits for the remainder of the game. On the NBN player’s turn, Jackson Howard is revealed as the new asset, and NBN offers to put their Spin Doctors to work to decrease the city’s unrest. You may want your corp to direct the city’s business and claim valuable assets, but at least one of the other corps is going to want to see you fail. Maybe more than one. And these corps may try to undercut your deals by countering your offers. Or another corp may simply covet the asset that entered play that round, and since all the game’s assets are different, its CEO may propose a counteroffer, even if that corp has no reason to see you fail. It’s even possible for people to suggest alternate courses of action simply because they think they’ll actually help the city—not just the corps. If there are ever two corps, then, that have proposed alternate deals, the other corps will decide which goes forward. They can support one deal or the other by placing any number of action cards from their hands facedown next to either the offer or the counteroffer. The corp whose action receives more support then resolves the action and lays claim to the asset. Your actions and assets, in turn, will frequently help you amass capital, especially if you use them to trigger the conditions that innately favor your corporate interests. For example, NBN gains one capital for every point of reduction in the city’s unrest while Weyland gains two capital whenever a production outage is removed. After the Weyland Consortium responds to NBN’s offer by countering with Budget Renovations, the other corps divide their support. The active player’s offer wins the tie, so NBN claims Jackson Howard and uses their Spin Doctors to reduce unrest by one stage in two districts. Because NBN gains one capital for each point of unrest that is decreased, it moves two spaces forward on the capital track. For these reasons—and others—it may sometimes even be in your best interests to spend money to make money. New Angeles allows you tremendous freedom to secure the support of the other corporations. You can bribe them with capital, you can promise them your support in future turns, and you can even allow them to resolve the actions you pass. The result is that New Angeles is truly a game of wheeling and dealing, and you’ll be trying to manipulate the other players every bit as much as you’re trying to make the best possible use of your cards and abilities. Running a business is one thing. Running a city, it turns out, is quite another. But in New Angeles, you have to do both. Even as you maneuver your corp toward greater fortunes, you have to give a perfunctory nod to the little people of the city. It turns out that in a city of several hundred million people—officially 500 million, but likely closer to a billion if you include the disenfrancistos and the androids—things can quickly turn ugly if you don’t keep the general populace sated. Accordingly, you’ll need to spend some of your time keeping the city orderly and productive. If you can’t, you’ll see the threat of revolt increase, and rioting and chaos may even lead to U.S. government intervention. To keep the people happy and the city running smoothly, you’ll need to generate a specific variety and quantity of resources as determined by each demand card you reveal. These resources are produced among the city’s districts, but only where you have your android tokens available to generate them and only if you’re able to avoid strikes, outages, and the detrimental influence of orgcrime. The android token in Laguna Velasco would allow the corps to generate the district’s three capital at the end of the round, except that a district with an orgcrime unit cannot produce its primary resource. Accordingly, you’ll sometimes find yourself forced to detour from more lucrative endeavors in order to keep the city running smoothly. And you may even find yourself temporarily aligned in this endeavor with your rival. However, the alternative is failing to satisfy the city’s citizens, allowing them to shift increasingly toward chaos, and flirting with the idea that the U.S. government will come in—along with all its laws and regulations—to take over the city’s governance. This threat is tracked each round, along with each corporation’s wealth, and if the threat reaches twenty-five, big government takes over and everyone loses… except for the one player who might be aligned with the feds. If this is you, then your win condition is no longer making more capital than a rival corp; instead, you work to oversee this fundamental change in how the city is governed. Manipulate, negotiate, and bribe your way to riches. New Angeles is available now at The Wandering Dragon!